This live studio album is the fifth studio album I have recorded for the Highlands-based Watercolour Music and the second with my band ‘The Acoustic Unit’ (Jim Drummond: drums and percussion – Duncan Lyall: bass – Angus Lyon: accordion and keys). 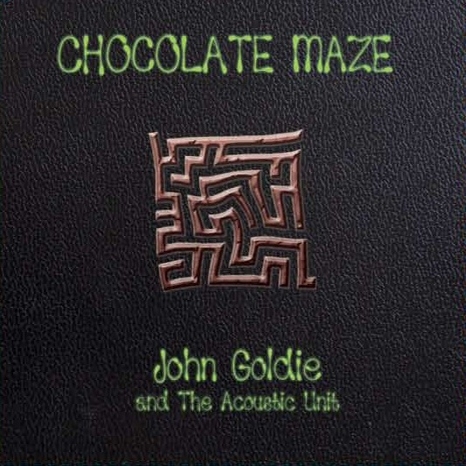 Chocolate Maze features thirteen new studio tracks from the band with Nick Turner on production duties. Lanarkshire-based guitarist John Goldie provided the music for the BBC’s comedy series Dear Green Place a few years ago and there are several tracks on this fine new album that could appeal to television producers looking for catchy theme tunes. Goldie is a guitar-toting everyman and the range of musical styles featured here reflects his ability to sit in and fit in wherever he finds himself, whether that’s Road Trip’s gypsy-swing-bossa (reminiscent of Goldie’s time with Martin Taylor’s Spirit of Django), Overcast’s soul ballad style, MacFerry’s pinging bluesy shuffle, Her Ladyship’s Dance’s medieval measure, the proggy Sting in the Tail or the insistently catchy hoedown, Time Trance. Accordionist-keyboardist Angus Lyon, bassist Duncan Lyall and drummer Jim Drummond form a tight, matey pack on the band numbers while Goldie’s worldwide travels as a solo guitarist are reflected in the superb Here and Now, all gentle harmonics and impish pitch bends, and the fingerbustin’ Chase, with its echoes of Adrian Legg’s virtuosic country twang. From The Sunday Herald, May 26, 2013. Reviewing this under ‘folk’ is stretching things slightly. Master guitarist John Goldie, here in the company of Highland music stalwarts Angus Lyon on accordion and keyboards and bassist Duncan Lyall, plus drummer Jim Drummond, careers across genres with gleeful abandon, opening with a flourish of Lyons’s accordion for the European-sounding Too Close to the Campfire and tailing off with a perky reprise of the slightly cod Americana of Line Trance. In between, Goldie, playing mainly but not entirely acoustic guitars, gives the impression of thoroughly enjoying himself, whether in the sassy bossa of Road Trip, the near ambient languor of the title track, the waspish guitar lines and bluesy shuffle of MacFerry or the unabashed rock guitar strains of Sting in the Tail. In contrast, my own favourite is the easeful drift and sweetly whining note-bending of Here and Now. Jim Gilchrist, From The Scotsman, May 26, 2013.